Although most future forecasting is done by looking at the general swath of planetary aspects during a particular time period (like the scythe-type bucket chart of early 2007), or occasionally by looking at an individual nation’s transits and progressed chart (see: America Quo Vadis or Dark Days). Those are roughly parallel to normal, everyday transits and progressions, but on a grander scale. 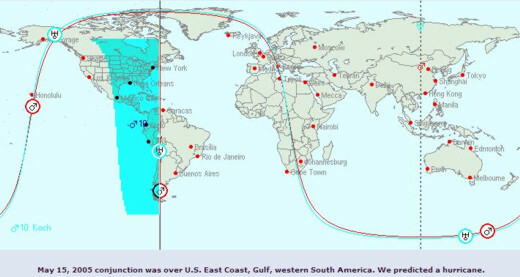 Another approach is forecast by single events, such as the ingress of a year or a season as seen from a particular capital, or extremely rarely even a national solar return (a bit tricky, since that’s more like a human lunar return, because nations live on an expanded time scale, see: Adolescent Nation). It's like a snapshot in the sky, from which you glean some kind of predictive information. There’s a third, halfway approach, which is to do a chart for a major conjunction and find where in the world the conjunction is at the Midheaven, presumably making that the area where its manifestation will most be heard about in the following cycle. Outside of commonly done local lunations, perhaps the most prominent example is the conjunction of Mars and Uranus, which happens roughly once every two years. Find where that occurs at the Midheaven, and you’ve got your finger on the location of the Mars-Uranus pulse (explosive events, violence, conflict) for the next two years. The first we heard of this technique, it was applied by Al H. Morrison to the penultimate Mars-Uranus conjunction of World War II, September 9, 1943. That one was on the MC directly over Japan, where the war was to be finished by the atomic blasts announced to the world (hit the front pages) on the day of the very next conjunction of August 17, 1945, three days before the war’s end. 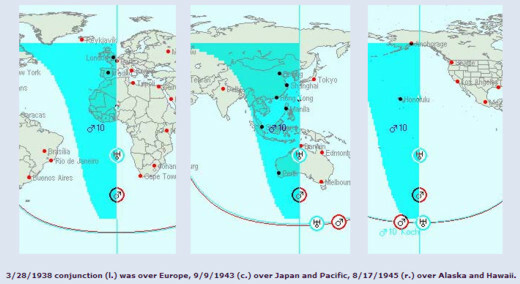 Dramatic, indeed, but maybe a little confusing, because the 1945 conjunction was actually on the MC over Alaska and Hawaii. Was the ’43 or the ’45 conjunction about the blast, or both? And if it was the ’43 event, then what happened subsequently in Alaska and Hawaii to gather dread fame and explain the '45 conjunction? We’ll go along with Al and suggest that it was, indeed, the ’43 conjunction that covered the bombs, because in fact the ’45 one presaged the greatest tidal wave to hit Hawaii in the 20th century on April 1, 1946, which was spawned by an earthquake in Alaska. Nice fit. 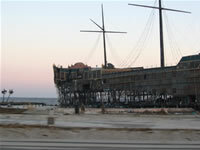 For details on that destruction, go here. 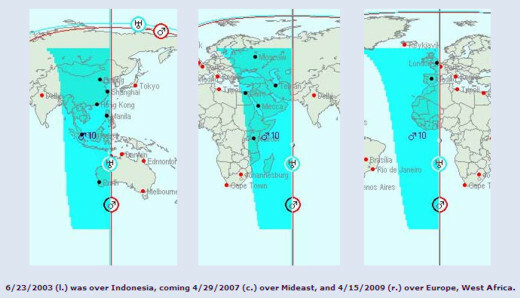 Fast forward to this century: the last two conjunctions seem to have done a pretty good job in predicting the most-covered disaster stories, first the Indonesian tsunami, then hurricane Katrina. See the accompanying maps for illustration — certainly the advent of astrocartography has made such investigations far easier in recent years! In both of these, it would appear the inclusive swath of the 10th house is where you want to look, rather than toward the 9th house side of the MC. The trouble of predicting disaster in any one part of the world over a two-year period is that so much disaster happens anywhere and everywhere in that long a period that it may be meaningless, especially during times of general world conflagration. Nevertheless, the technique does tend to catch the most publicized (10th house, MC) ones in each period, so it’s good for something. For instance, although WWII got lots of coverage in both European and Pacific theaters during 1943-45, the atomic bomb certainly was the plum in the pie. It doesn’t always work out so neatly, across the generations, and every now and then we’ve been hard-pressed to track down the appropriate disaster to match. That’s made especially more difficult in times it happens when Mars is slow or changing motion, near its station, as it’s really hard to tell exactly when the exact conjunction occurs, within the necessary few minutes, even with the best of calculation programs. Another problem in using this to predict is not in having too much destruction to pinpoint, but not having big enough examples of it. The bigger the conflict, the more it seems to be on the mark. 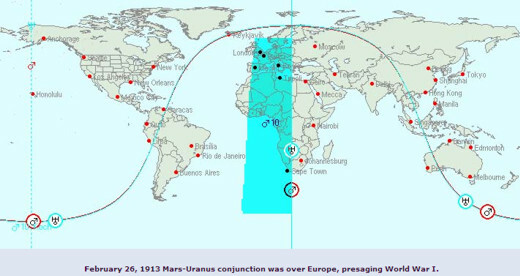 The Mars-Uranus conjunctions immediately previous to both WWI and WWII were directly over Europe, spot on. The one before the beginning of the latest war in Iraq didn’t really register at all, possibly because the invasion's decisive rapidity wasn’t sufficiently destructive at the time, and its result is only just developing into something fiercer now, perhaps. The conjunction happens every two years, but major global conflicts and catastrophes don’t, so you can’t expect it to deliver in spades every time, thank goodness. We haven’t found an indicator that predicts size or intensity, and perhaps it lies somewhere in the rest of the chart. The usual common considerations don’t seem to tie in too well, however, like the sign or element it’s in. We’ve just had two in a row that were water-oriented, with the conjunction in water, but the air conjunctions of ’43 and ’45 brought both fire and water results. WWI was air, WWII earth, and there doesn’t seem to be a logical connection right off.